Log into Crowdskout and navigate to Settings > Integrations > Iterable. Make sure to name each account accordingly as this descriptive text will translate to a custom attribute. This custom attribute will tag each profile pulled in from Iterable. Each Iterable account added will have its own unique custom attribute that you assign upon set up. You can connect multiple Iterable accounts once you have connected your first Iterable account. Select whether or not to import data. Under Import Data with This Connection you will see a toggle to regularly pull in data. If you select Yes this will mean that all current data in your account and all future data in your account— including historical email campaigns, emails, and email campaign stats— will be pushed to Crowdskout. If you select No this will mean that no data will be pulled in your Crowdskout account from the Iterable and you can only push data from Crowdskout to Iterable. When pulling in data from Iterable make sure to select the correct Iterable lists you'd like to use when importing data. If no lists are selected, all lists will be pulled in. Add your Iterable API key to CrowdSkout. In Iterable, grab your API key by navigating to Integrations > API Keys. You'll need to have permissions to view the API keys page. In Branch, paste your Iterable API key in the API Key text box. Click Connect to save and connect your Iterable account. 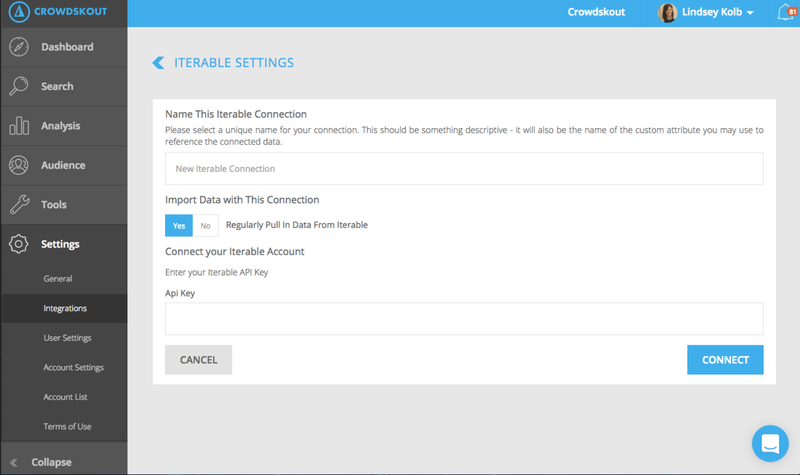 If you have selected Yes to the Import Data with This Connection toggle, Crowdskout will then begin to migrate the historical data from Iterable over to Crowdskout. To export data from Crowdskout to Iterable, navigate to Actions > Export and select the Iterable list you'd like to export to. You can also export audiences from Crowdskout to Iterable through the Export tool. If you have questions about Iterable, send a message to support@iterable.com. If you have questions about Crowdskout or its integration with Iterable, take a look at this Crowdskout support article.